The fireworks season now seems to go on ad infinitum. 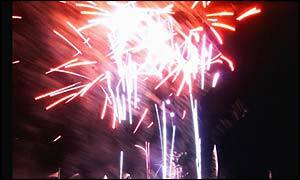 First Halloween, Guy Fawkes Night and Divali, from October to the new year, the nights are filled with bangs and booms. Many of our dogs face weeks of terror by the indiscriminate and prolonged use of fireworks and some are injured - even killed - by nasty exploding fireworks. If we can't ban them, at least we can help our dogs to ride out the storm. Dogs terrified by the sound of fireworks are being offered help by a university research team. The University of Lincoln says it has developed a chemical which will reduce the stress experienced by dogs when they hear fireworks explode. With bonfire night approaching, many dogs 'find this a miserable time of year, petrified by the unpredictable bangs,' says Daniel Mills, principal lecturer in Behavioural Studies and Animal Welfare. The treatment is delivered by a plug-in device, similar to air-fresheners, which will send a soothing pheromone into the air. 'Many owners resort to seeking drugs for their pets in order to help them cope, but this is a simpler solution,' said Mr. Mills. This 'dog appeasing pheromone' is a synthetic version of naturally-occurring chemicals which help to reassure newborn pups. Researchers believe that anxiety can be triggered in animals by exposure to sudden and unfamiliar experiences. And this pheromone can dampen these sensations by giving animals an artificial sensation of familiarity, which acts against the tensions caused by the sudden loud noises of fireworks. 'Unlike drugs, the diffuser does not sedate the animal and make it sleepy,' says Mr. Mills. by the indiscriminate and prolonged use of fireworks. If you feel strongly about the indiscriminate use of fireworks throughout the Guide Dogs for the Blind has had the courage to take on the debate with a petition on its WEB site below. They are not advocating a total ban on fireworks but more control to limit fireworks to specific public occasions such as Guy Fawkes Night on 5 November and New Years Day when those with pets which react badly to the bangs, pops and whistles can plan ahead. To read more about the petition go to - http://www.guidedogs.co.uk/fireworks/ or go straight to the petition to sign up at - http://www.guidedogs.co.uk/fireworks/reg-form.htm If you know of anybody who feels as you do about this subject, or maybe those that haven't even given it much thought, please forward or copy this e-mail to them*. A shocking new RSPCA survey of vets in England and Wales has found that last year 4,825 animals were treated for firework-related injuries and/or prescribed sedatives because they were so frightened by the loud bangs and flashes. The RSPCA believes this is unacceptable and is calling for the government to reform fireworks regulations and restrict public use of fireworks.